While most gardeners focus on the plants in their garden, it’s the non-living, man-made hardscape elements that are most important in a well-thought-out adapted garden—mainly because they are the most expensive aspect to change. Uneven paths can be a tripping hazard, and gaps between flagstones or other surfaces can catch heels or canes, causing falls. If you use a walker or wheelchair or have friends that do, your utmost concern must be to ensure it’s easy and safe to negotiate through all parts of your garden. Take pictures of what areas need to be changed, and photograph hardscapes you like in your neighborhood. Consult with professionals. Check out landscape books at the library. Ask your gardener friends. With some careful planning, you can make the necessary changes you’ll appreciate every day. Above all, as you do your research, keep in mind which materials will give you easy-care upkeep, and be sure to consider what will be needed for on-going cleaning, sealing or repairing. The best solid surface solutions are concrete, flagstones, or pavers. POURED CONCRETE patios and paths are low maintenance and less expensive to have installed than other materials. They don’t have joints or spaces for shoe heels to get stuck or for weeds to grow through. They can be tinted with stains for color or stamped with patterns to add texture. However, concrete is prone to cracks—they say cracking is a feature of concrete, not a flaw. Concrete surfaces are difficult to repair and require sealing every two to three years. be your #1 goal to eliminate. PAVERS are blocks of stone used to create patios and paths in a vast array of colors, shapes and patterns. 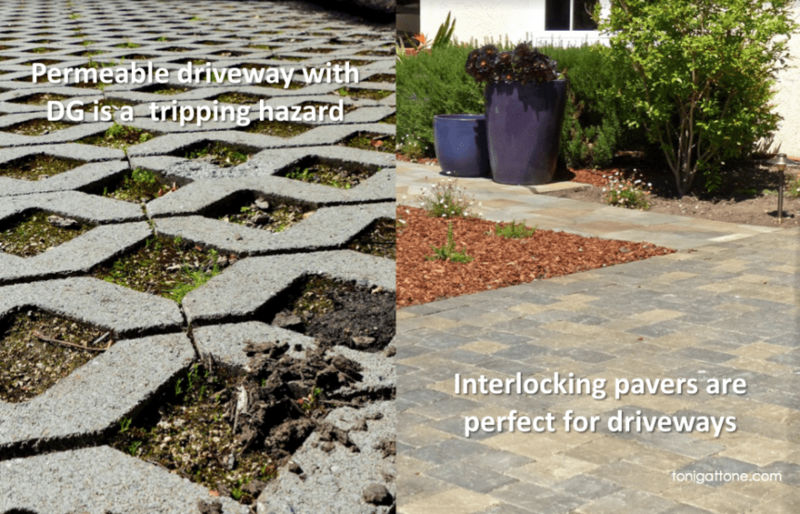 Interlocking pavers won’t crack—they lock horizontally to resist side to side shi ing, and vertically to keep them from moving up or down. They are easy to repair and easy to expand. They’re also the most expensive option initially—they’ll typically cost you 10–15 percent more to install than concrete. However, durable pavers are three to four times stronger than concrete and carry a longer warranty. 1. Groundcovers. They’re beautiful and quite effective, as long as your area doesn’t suffer from the occasional drought, which will cause them to dry up and create more gaps. 2. Decomposed Granite, known as DG, looks great and has many advantages, but what a lot of people don’t tell you is that you will need to make additional applications over time because it blows away. It can also be difficult for wheelchair users because the small stones can get stuck in the wheels. They can also get stuck in the treads on the bottom of shoes. I have a friend whose house- warming party ended on a sad note when she realized her guests had unknowingly brought in DG on their shoes, and her brand new cherry wood floors were badly scratched. 3. Artificial turf can work really well and is inexpensive because all you need are scraps to fill in the gaps and it looks great for a long time with no replacement. 4. Gravel, river rocks, and wood chips are my last choice, simply because they are always loose and can be an accident waiting to happen for anyone with balance issues. They can be a challenge for wheelchairs too. Wood chips, in particular, lack the firmness and traction needed by gardeners with canes, crutches, walkers, and wheelchairs.